Fluid Head Monopod - Are They Worth The Money? So you're wondering what exactly is a fluid head monopod used for and is it worth spending the extra money to get one. This article will give some ideas on whether a fluid head makes sense to use on a camera monopod. A true fluid head gives you the ability to create smooth motions. 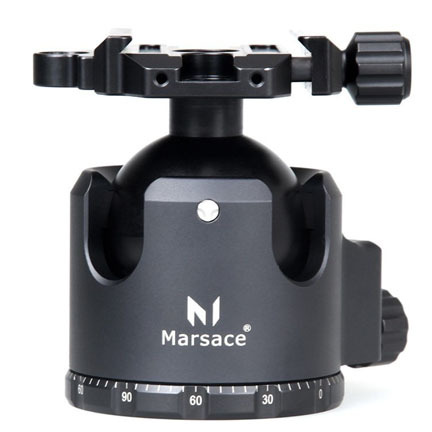 Monopod heads come is a variety of shapes, sizes, and functions and fluid heads perform quite differently than ball heads and traditional pan-tilt-swivel heads. 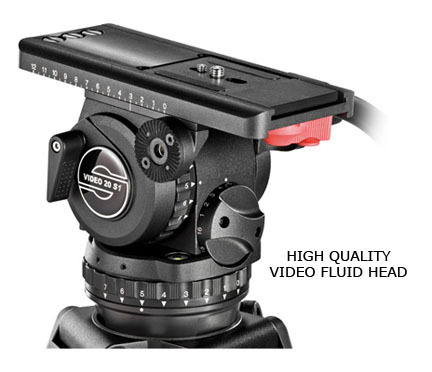 Fluid heads are the most widely used monopod head for shooting videos. 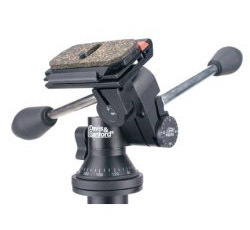 They dominate the professional motion picture industry, and as smaller cameras with improved video capabilites are becoming more popular, so are the fluid heads that adorn monopod and tripods. All fluid heads are not created equally. True fluid heads contain a viscous fluid that dampens friction and lubricates moving parts for smooth movement. Many manufacturers market their heads as "fluid" but contain no actual fluid oil as such. Many only use a heavy-duty grease to improve tilt and shift smoothness. Don't get me wrong here Digital Photography Tips readers, there are some decent heads with fluid in their descriptions, and contain no internal fluids, that function quite well, particularly with compact and point-N-shoot cameras. Like any head used on a monopod for shooting video, these heads reduce camera shake and a flimsy head of any variety won't steady a heavy camera. The big advantage by far is the transitional movements on the vertical axis (tilting) and horizontal axis (panning) while shooting video. Static video with the camera stationed in the exact same spot doesn't allow you to change perspective and viewing angle of a stationary subject. Combined with a monopod, a fluid head can act as a simple, although somewhat limited, Steadicam. There are several techniques that will smooth out the movement of your camera/monopod while physically moving your position during video shooting. Lots of tiny parts in the more sophisticated models add to the cost of making them. The bigger heads add weight to your overall monopod/camera combination. To me, the small amount of added weight is not very significant, except in the case of using a heavy duty model on a very light monopod. 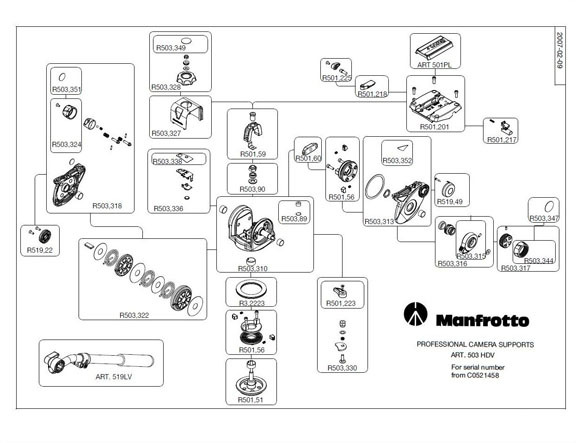 The diagram below of a Manfrotto HDV fluid head illustrates the complexity involved in making a quality fluid head. Just like other digital cameras and their accessories, there is so much being offered "out there" that it can get confusing to figure out which is the best fluid head monopod to use. As I've mentioned, my views and opinions are just my own, based on my 40 years of photography experiences. Monopods have limited use when it comes to shooting long exposures and nighttime photography where your camera must be kept perfectly stationary. 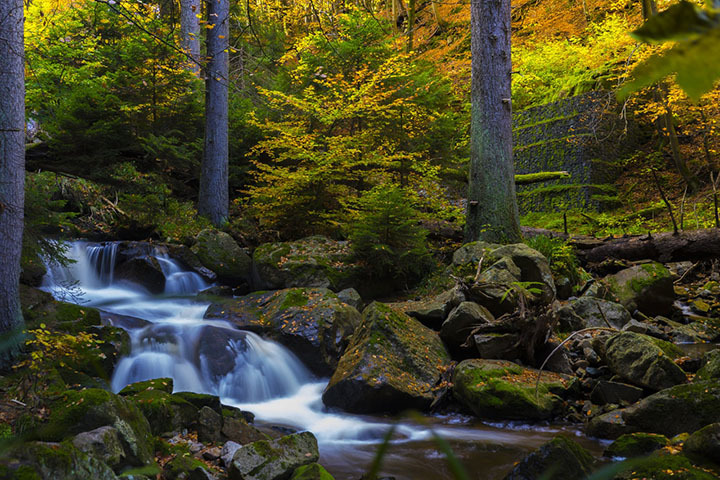 For example, a very long exposure was used to get the creamy looking water effect in this waterfall photo. Ever photographer has a different perspective and it will be of great value to you to explore some other opinions. I rely heavily on consumer reviews when I am looking for information of photography equipment as well as everyday household items. Amazon is a great source because it has millions of customers with opinions. Even if you don't buy from the site it's worth reading about opinions of others who have purchased and taken the time to give their product reviews. If you do happen to order anything from Amazon, and you get there from a link on my site, it helps me keep this Digital Photography Tips site going. It doesn't cost you anything-Amazon can afford to do that at their expense. Thanks, I appreciate your support. Have a blast with your photography. Keep it fun!